These aren’t my pants — and other ways I’m bootstrapping my way to the top. There are a lot of secrets when it comes to starting a business. The first secret I discovered when I started my own business, designing toys that teach empathy and failure, was that entrepreneurs barely pay themselves for at least the first few years. That’s because we are merely vessels, dare I say, train stations for money. As sales increase, more money comes through your station, but it’s not stopping. It has places to go, people to see, talks to give. You are merely waving to it on its way through your station. Wishing it luck, and hoping it comes back. Maybe it even brings a few friends with it when it returns. Making the train stop when you’re just beginning means it won’t go towards other things. Things that are far away and hard to get to otherwise. So you keep waving at your money, saying hello and goodbye, and working until, one day, hopefully, the train makes a stop at your station. That day still hasn’t come for me. In 2010 I quit my job as a lighting designer, moved in with circus performers in an old theatre space in Montreal, and got a $1,200 artists grant to make toys and teach myself how to start a business. I had no idea what I was doing but I was determined. I decided I could make it happen as long as I told every person I met what my plan was: I was going to change education with toys. 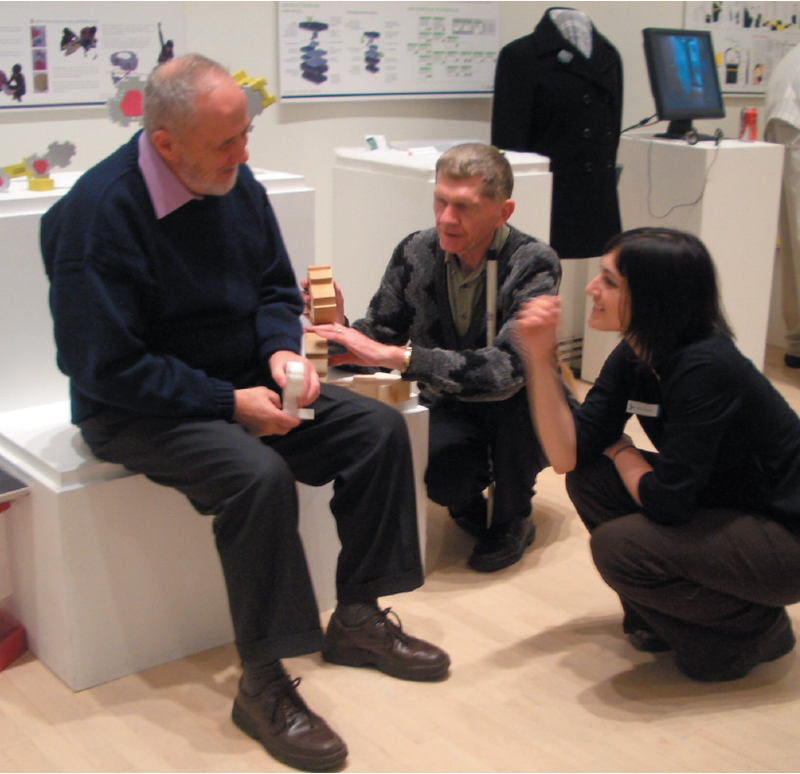 A few years earlier — in my thesis year of Industrial Design at Carleton University — I had designed a toy that taught empathy and what I referred to as “creative dialogue”. I had originally designed it as an aid for the Canadian National Institute for the Blind to bridge the social gap between visually impaired students and their sighted classmates and, in the process, I discovered it was just as challenging and rewarding for sighted adults. My blindfolded puzzle game ended up winning Best in Show at a prestigious design competition for recent grads and I pursued the most obvious next step — I tried to find a company to buy the idea. With the former President of the Canadian National Institute for the Blind, Euclid Herris, at my design graduation exhibit. It resonated with me because growing up in Winnipeg I was a really good student. Mostly because getting a full scholarship was my only way out of Winnipeg, and into what was considered the best Industrial Design program in Canada. So I worked hard, got my scholarship, and then discovered being good at school had almost nothing to do with being good at life — or work for that matter. Now, four years after officially starting Twenty One Toys, I know the challenge that every school and office is facing with the future of jobs — that in the next 5 years, 35% of the top skills necessary for the workforce aren’t aligned with the skills we’re teaching, or the skills we’re hiring for. Companies like Google don’t even ask for GPA or test scores from candidates anymore… because they don’t correlate at all with success at their company. But I didn’t know that yet, I just knew I wasn’t happy and I wanted to somehow help “fix” education. So I started searching for work that combined design and social innovation, but it wasn’t simple. Eventually, it dawned on me that I had to start my own social enterprise with design at its core. What I was trying to do with the Empathy Toy in education was so strange and unknown; I knew no one else would understand it enough to make it work — so I designed a company to bring my ideas to life. I’ve got $1,200 — I’m rich! The artists’ grant I received in 2010 was for $1,200. It paid for a website where I wrote about my research and answered questions around design, which cost $400, thanks to my friend Anna, who cut me a deal. It was more like a blog of my research and ideas, but what I didn’t realize at the time was that I was building my SEO strategy. I used the rest of the funds to pay for prototypes made at my friend Harvey’s jewelry studio, and the rest went to two conference tickets: one for BitNorth, an unconference in the woods of Quebec, and the other for The Feast in New York. Both conferences not only opened my eyes to the incredible work engineers, designers, and entrepreneurs were doing to make the world a better place — it also was the beginning of my acceptance that I wasn’t just a designer, I was a design-entrepreneur. My first big break happened thanks to one of the requirements of attending BitNorth — to attend you had to present. So I presented my toy and my vision of what I was trying to build, and one month later, I was lucky enough to get booked as the first TEDx speaker in Montreal. The day after my TEDx talk I moved to London, UK, to start an internship at a “socially motivated design consultancy” called Design Against Crime, which worked out of Central St Martins College of the University of London. I took the internship to essentially find out what “socially motivated design consultancy” even meant. Working there helped me to discover one model of building a socially motivated company with design at its core. They created design solutions, like bikes with built in locks, so if you break the lock you break the bike — rendering them unusable when stolen. They came to these solutions by talking to both the “users” and the “abusers” — meaning cops and “criminals” — a.k.a: empathy! I then ended my European summer in Finland, at a startup accelerator called StartUp Sauna, a program to give startups guidance, without investment or equity, in the woods of Otaniemi. I was one of 2 women in the program, supported by coaches, many from Angry Birds (their office was only a few minutes walk away). My goal while there was to get one of their coveted €15,000 — €25,000 grants to finally launch my business, and in the final week — I got it. Unfortunately, only a few weeks later, unforeseen circumstances meant I had to return to Canada prematurely, and I had to give up the grant. A typical day at StartUp Sauna in Finland. FYI — Those ARE my pants, shoes and jacket. Purchased before quitting my job. I don’t have €25k — I’m broke! I came back to Canada defeated and broke. I’d spent the last of my savings working to win that grant, and now I had nothing. One of my best friends convinced me to move in with her in Toronto. 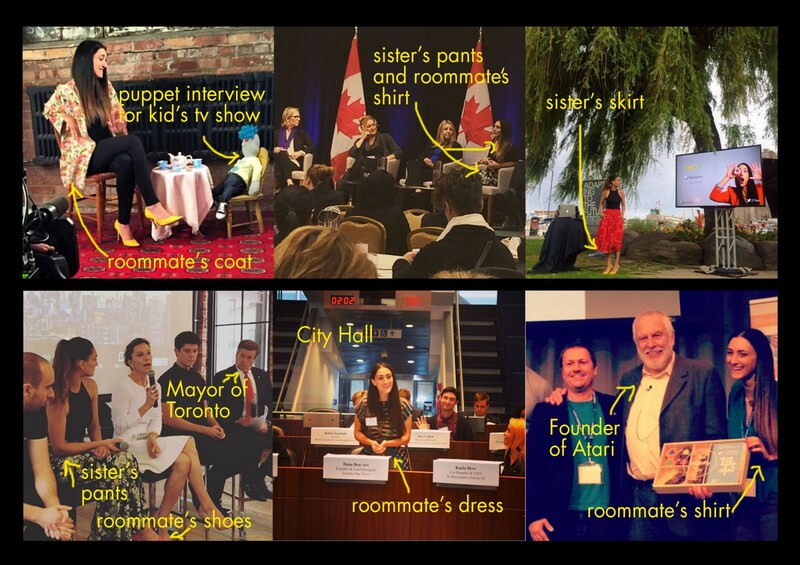 She said I could sleep on her couch, borrow her clothes and sneak into her workplace at the Centre for Social Innovation until I got back on my feet. So I slept on her couch for months, sneaking into every education conference I could, bouncing around between Montreal and Toronto. I gatecrashed more events, kept writing in my blog, and started getting requests to use the toys in youth programs in Uganda and Trinidad. I went back to Harvey’s studio in Montreal, made 8 more prototypes. Sanded them in another best friend’s lab, and sent them on their way. Then, just a month after publicly announcing the name Twenty One Toys, I made my first official toy sale to a school board in Toronto. Thanks to a consultant I met at one of those unconferences, a school board found my TEDx talk on Twitter and put in a pre-order for 30 toy sets. I nervously asked: “Great! Can you pay in full and wait 5 months for me to manufacture?” They agreed. The following week we won 3 awards — The Centre for Social Innovation’s Youth Agents of Change Award (free rent and mentorship! ), the Youth Social Innovation Capital Fund (a 2-year $10k loan), and the Spin Master Innovation Award (a 4-year $50k loan with mentorship). I bought pants immediately. Before I started a business, when I heard the term entrepreneur or “businessman” I would picture Robin Williams in HOOK: at his son’s baseball game, on his cellphone, being a bad father. What does bootstrapping really mean? It means it’s YOUR boots and, most likely, other people’s pants. It’s also worth noting that not everyone even has the privilege of borrowing pants. I don’t have investors, but I do have an incredible support system of family and friends, who lend me couches, clothes, and even donate trips and computers along the way. So the next time you see a bootstrapping entrepreneur, cut them some slack, and maybe buy them a coffee, or lend them a pair of pants, or a couch to crash on while they wait for their train to come in. It’ll make a world of difference. Ilana is a member of Founder’s Only and occasionally guest-posts here. Ilana Ben-Ari: Ilana is best known as the founder, CEO and lead designer of her first startup - Twenty One Toys. She transformed her thesis project into the company’s first product, The Empathy Toy. Originally designed for visually impaired students and their sighted classmates, it is now used as a tool to teach Empathy to anyone and everyone.